e-learning mode training to all TS Schools HMs, Principals & Districts front line staff: Two day e-learning mode training to RPs with knowledge of computer at DR. MCR HRD on 10th & 11th of August, 2017. Trained RPs acts as RPs for the District level training to the districts front line staff and head masters / principals of secondary schools. e-Learning mode Training to TS Employees, HMs, Principals for Competencies, skills improvement 2017. The Government has decided to provide training through e-learning Model from August 16 to 24 on capacity building to state government employees and teachers, Head masters, Principals. Sub: School Education – e-Learning – Conduct of Training to the Districts Front Line Staff and Headmasters/ Principals of Secondary Schools through e-learning mode – Participation of Principals working in Social Welfare, Tribal Welfare, BC Welfare and Minority Welfare Residential Schools in the Training – Deputation of Head of the Institutions to undergo training programme at Kesamudram – Reg. 1. Proceedings of the Commissioner & Director of School Education and Ex. Officio Project Director, RMSA, Telangana, Hyderabad Proc.Rc.No.43/RMSA/TS/2017, Dt: 08.08.2017. 3. Training schedule issued by the CPO, Mahabubabad. In the reference cited, the Commissioner & Director of School Education and Ex. 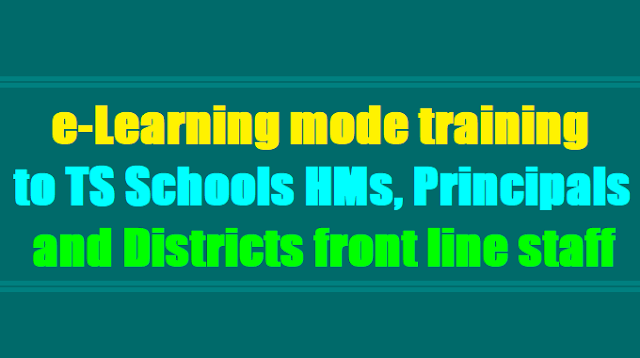 Officio Project Director, RMSA, Telangana, Hyderabad has issued the instructions for conduct of training to the District Frontline Staff and Headmasters/ Principals of Secondary Schools through e-learning mode at District level @ about 100 per day in computer labs in the District. In the reference cited, the Chief Planning Officer, Mahabubabad has identified the Heads of the Institutions to undergo training programme date wise and batch wise to the District Frontline Staff and Headmasters/Principals of Secondary Schools through e-learning mode. The details of Heads of the Institutions to be attended to said training programme at DRDAEGMM Center, Gudur Road, Kesamudram, Contact No: 9989822876 is furnished in the annexure which is enclosed herewith. The Heads of the Institutions are requested to attend the said training programme on the dates mentioned against each and report to the course director at DRDAEGMM Center, Gudur Road, Kesamudram at 10.00 AM without fail. The receipt of the proceedings should be acknowledged forthwith. Sub:- RMSA, Telangana - School Education Department - Conduct of Training to the Districts Front Line Staff and Head Masters I Principals of Secondary Schools through e-learning mode - Participation of Principals working in Social Welfare, Tribal Welfare, BC Welfare and Minority Welfare Residential Schools in the Training - Orders Issued - Reg. addressed to all the district Collectors cit. 25.07.2017. 2. Proceedings of C&DSE, Re.No. 43/RMSA/TS/2017, dt: 08.08.2017. 3. Instruction from from Director General & EO, Spl. CS to Government, Dr.MCR HRD Institute, dt: l l.08.2017 on the participation of Principal from TSWREIS Institutions and Gurukulam. All the DEOs in the State are hereby informed that vide reference I &2 cited, detailed instructions have been issued for the conduct of training to the district Frontline staff and Head Masters I Principals of Secondary schools through e-learning mode at District level from 16th August onwards@ about 100 per day in the available computer labs in the districts. The training to the District E-Learning Resource Team have been conducted at Dr. MCRHRDI, during 10th and 11th of August 2017, who inturn conduct the training at District Level as Resource Persons. In this regard, vicle reference 3rd cited, it is proposed to include the Principals working in Social Welfare, Tribal Welfare, BC Welfare and Minority Welfare Residential Schools in the e-Learning Training programme. Therefore, the DEOs are directed to communicate to the Principals working in Social Welfare, Tribal Welfare, BC Welfare and Minority Welfare Residential Schools for their participation at District Level one day Training programme scheduled during 16th to 24th August 20 17. The Names of the Principals along with particulars in the proforma given here under may be furnished to to Dr. MCRHRDI and a copy to O/o C&DSE, Telgangana, Hyderabad. Therefore, the DEOs are requested to take immediate necessary action to inform to the Principals for their participation. e-DMs. The DEOs of Manchirial, Asifabad, Nagarkurnool and Mahaboobnagar have been directed over phone to focus on the suitable venue with Computer Labs and Internet for the conduct of training. In this regard, instruction have already been issued vide reference 211ct cited, to take high speed Internet connection to the DIET/CTE/IASE Computer Labs duly using the available funds with DEOs pertaining to SSA & RMSA. Proceedings Of The Commissioner & Director Of School Education & Ex-Officio Project Director, Rmsa, Telangana, Hyderabad. Subject: RMSA, Telangana - School Education Department - Conduct of Training to the districts front line staff and head masters / principals of secondary schools through e-learning mode -Orders Issued - Reg. Reference: Lr. from Director General & EO, Spl. CS to Government, Dr.MCR HRD Institute addressed to all the district Collectors dt. 25.07.2017. All the DEOs in the State are hereby informed that vide reference cited, instructions of issued to the District Collectors informing that the MCR HRD proposes to conduct training to the district frontline staff and head masters / principals of secondary schools through e-learning mode at District level from 16th August onwards @ 100 per day in the available computer labs in the districts. The collectors are being requested to confirm the venue with a vote 50 computers to train the about 100 participants per day and cover about 300 participants per district. In this regard, following that the further instructions on the programme. The participants will be Head Masters / Principals of Government, Zilla Parasad, Model Schools, KGBVs, Residential Schools. Preferably the participants is shall be less than 55 years in case wherever the head masters / principals age is above 55, there the senior most teacher name may be sponsored to undergo training. The lists of participants and name of the school must be e-mailed to the office of C & DSE, TS, Hyderabad. Further, information was given through whatsapp that each DEO shall identify one head master / principal / school assistant with knowledge of computer to be deputed to Dr.MCR HRD for a two day training scheduled on 10th & 11th of August, 2017 for RP training who intern act as RP for the district level training along with district planning officer e-DM. Therefore the DEOs are directed to depute such identified person to the RPs training at Dr. MCR HRD at 10 AM on 10th August, 2017. All the DEOs and principals of DIETs, CTEs and IASE have directed to make computer labs of DIETS, CTEs, IAEs functional with internet connection of high speed. The internet charges and other contingencies shall be met from the available funds i.e., SSA / RMSA with the principals. The computer labs must be ready before 15th August, 2017 without fail and provide labs for the training based on the requisition from the district officials. All the DEOs are directed to take immediate necessary action and send the lists of HMs / Principals along with school name and name of the Resource Person to be deputed to DR. MCR HRD on 10th & 11th August, 2017. All the DEOs are directed to depute identified RP to attend training at DR. MCR HRD at 10 AM on 10th August, 20 I 7 without fail.